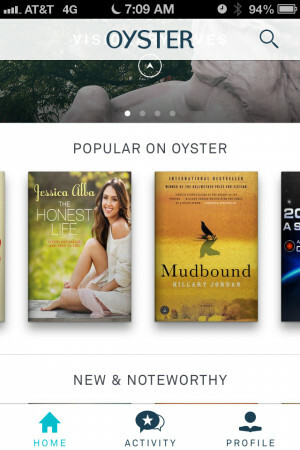 Earlier in the month Oyster launched a new service for ebooks that is similar to Netflix where users can get unlimited access to a catalog of content for a monthly fee. In the case of Oyster, they have around 100,000 ebooks, and customers can read an unlimited number of those ebooks for a monthly subscription of $9.95. The hardest part for Oyster is of course getting publishers to agree with this. Right now there are only a few publishers on board, including HarperCollins, Workman, Houghton Mifflin Harcourt, and Smashwords. Personally I haven’t tried Oyster yet because they currently only offer an iPhone app. Supposedly iPad and Android apps are coming later this year. Any iPhone-wielding readers out there try Oyster yet? What’s is the selection of ebooks like? That’s one of the biggest hurdles that I can see. Not only is there a limited selection of ebooks available, but Oyster doesn’t show what ebooks or authors are available before signing up. Right now they are only offering the service by invitation only (you can request an invite on their website), so hopefully they will add a viewable online catalog at some point. There are reviews of Oyster’s ebook service over at Arstechnica and The Digital Reader that describe the app’s features and what the service is like. Both agree that the selection of ebooks isn’t great, but neither had a problem compiling a good-sized list of interesting ebooks to start reading. The way Oyster works is you can download as many ebooks as you want to the Oyster app after forking over the monthly fee of $10, but you don’t own the ebooks and you can’t read them outside of the Oyster app. You can read them offline. But once you stop paying the monthly fee you can say goodby to your ebook library. That’s definitely the downside of a service like this. You’re paying for something every month that you don’t actually own and then when you stop paying you won’t have anything to show for it. And what if Oyster goes under a couple years down the road? Then you will lose access to your library of ebooks. A monthly subscription service for something like TV and movies works great, but I’m not so sure it will work as well with ebooks. I guess if you are a voracious reader and read several ebooks per week then it could save a lot of money in the long run. But then again you can get tons of ebooks from local libraries and they are free. Still No Sony PRS-T3 in the US – Does Anyone Care? I can see this working well if your local library e-book selection is limited (which mine is). I can also see it working well for people who have a limited budget but like to read and don’t really care if they own the books or not. $9.99 a month is a pretty good price to be able to read as many books as you want per month. It sure beats Amazon Prime one book a month. Nathan, I agree with Liza about this. The subscription model also works for music and I could see the publishers eventually coming around. What I’m wondering is if this could be made to work with Adobe’s DRM since the libraries have an expiration date on their books, but you would get the benefit of the ebooks working with ebook readers. I have a hard time seeing this work out long-term. $10/month is a lot for books. Heck, even Netflix is only $8/month. If I have a lot of free time, I might make it through 3 books a month, but most likely only one or two. I just don’t see this appealing to the masses. You may be right, It may end very well becoming a niche service. I didn’t subscribe but did get the invite for it. I thought they had a fairly decent mystery selection (my passion these days). Dennis Lehane and Jo Nesbo (love his books) were on there. I just found a lot of the books on there were books I’d already owned or read. Eh, I don’t think content is much of an issue. In the 4 or 5 years I’ve had a reader I’ve accumulated far more books (without even really trying) than I’ll be able to read in a lifetime (and only about 20 – 25 of them cost any money. And I’m not sure $10 bucks is much of a deal when the public library provides the same service for free. This could be a boon for Romance novel addicts, IF the selection is comprehensive. My wife reads a couple a week, at $4-$8 a pop, so going from $40+/mo to $10/mo would be great.